2. a low-fat cake (with dairy and the usual all-purpose flour). 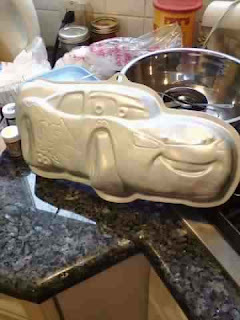 Preheat oven to 350 degrees Celsius. Mix the dry ingredients together well. Add the oil, vinegar and vanilla. When the mixture is thoroughly moistened, add the water and mix until smooth. 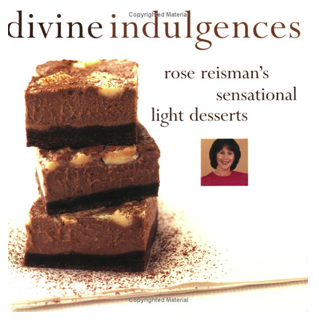 I made Rose Reisman's Sour Cream Chocolate Cake from her Divine Indulgences dessert cookbook (using low-fat yogurt instead of low-fat sour cream). But her Milk Chocolate Fudge Cake would work just as well. 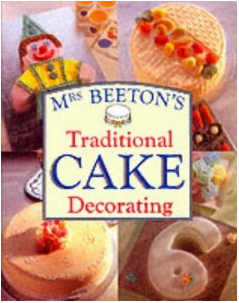 I had good success (both times) following the directions in Mrs. Beeton's Traditional Cake Decorating. This is a very traditional (and, therefore, I think not proprietary) way to make Royal Icing, beaten entirely by hand with a wooden spoon. You must be sure there is no grease on either the spoon or in the bowl before you start. -Put two egg whites in a bowl, break them up with a fork. -Then gradually add icing sugar, up to approximately 2 cups, beating thoroughly with the wooden spoon between additions. 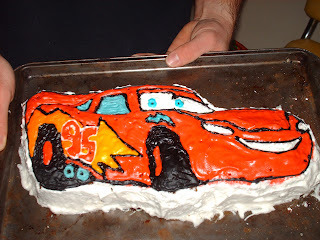 -Keep beating (your arm will get sore) until the icing is white (not creamy) and the required stiffness. -I found that a soft peak stage icing piped well ("soft peak"meaning that when you lift the spoon out of the icing, an icing peak forms, but flops over). 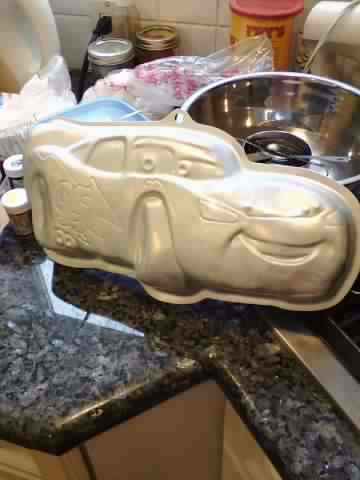 -Make sure any icing you're not directly working with stays covered, as it will otherwise dry out. Here's also a link to a recipe that calls for use of an electric mixer. I haven't tried it, so do let me know if it works for you. An online version of my favourite icing is here. (Myself, I use corn syrup instead of cream of tartar.) I typically make this into chocolate icing by folding in 2 or 3 squares of melted, unsweetened chocolate after I've removed the icing from the heat (though that does add fat). 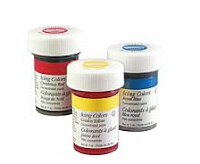 2. mix the icing colours as needed, working up and down the colour scale (e.g. use leftover yellow to make orange). 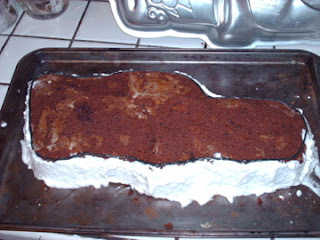 -First, I iced the sides of the cake in white "7-Minute" icing with a knife. 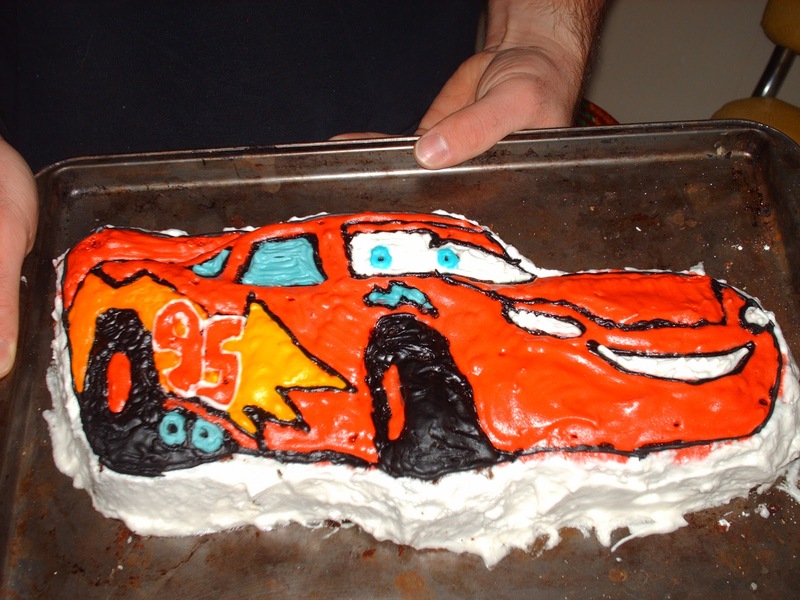 -Next, in a new bowl, I coloured some Royal Icing black (add cocoa powder first to darken the icing) and piped the outlines of Lightening McQueen. 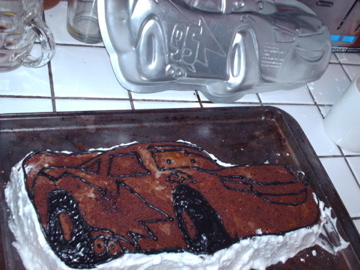 Then I used it to fill in the tires of the car by piping in sweeping lines across the shape and "smoothing" the icing just with my finger. -Then, in another bowl, I mixed some blue "7-Minute" icing. In the icing bag I mixed some of the blue icing with a dab of the black icing to make a grey-blue. This filled the side windows and the muffler, using the same technique as with the black. -After cleaning the bag, I put in some of the un-tinted blue (i.e. 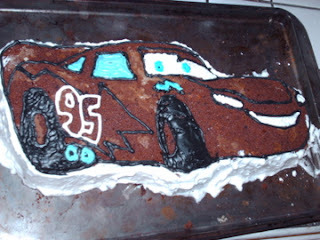 no black) icing and piped Lightening's eyes and the little blue lightening bolt on his hood. -Next, in another bowl, I mixed, piped and smoothed some "7-Minute" icing in yellow, then orange, and finally red, which covered the body. As I mentioned, I found a #4 decorator tip to work fine for both piping the outline and filling the shapes.